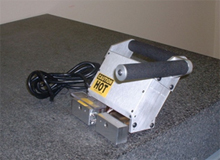 Special tool developed to “iron” insulating fabric to conform to a cylindrical form and flange. This was a pair of hand tools purpose-built to fill a unique need. Each had a temperature controller, a heating element, thermocouple, and power supply all built into a compact 5 lb. package. 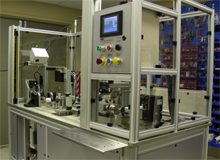 Tiny spray nozzles are automatically inspected for defects in the nozzle orifice. Each feeder bowl can be selected, depending on the part to be run. 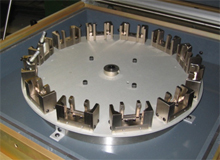 Parts feed into the vertical index wheel, where they are inspected and rejects are removed before good parts are released from the part nests. The pins were fed from a bowl feeder. A vision system inspected and then oriented each pin chamfered end-up. 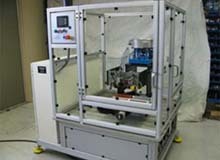 This machine is the 2nd generation of the original which has run around-the-clock continuously for over 6 years. 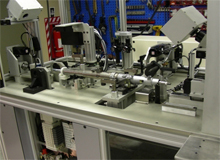 Automatically tests the operating forces of a steering column. 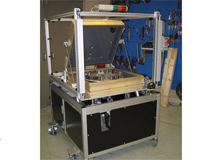 Four servo drives function the column, while load cells monitor forces. 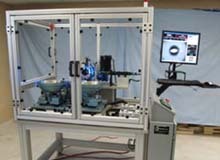 Two vision systems inspect selected part locations, and a programmable impact marker date-marks the column at the end of the test. PLC-based control with touch-screen user interface, providing access to all set up parameters and diagnostic information. 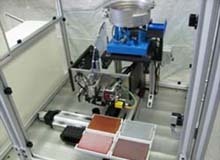 Provided a test platform for mounting and spinning electronic components. 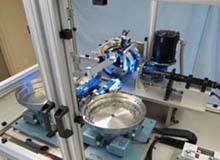 Hand-loaded and automatically cycled through the test while interfacing with the customer’s analysis equipment housed within the mobile machine. 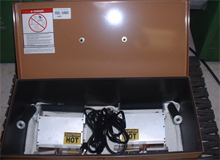 The system featured a custom-designed EMI/RFI shielded enclosure and unique part holding tooling.